Taking the SAT exam is a rite of passage for high school students who plan to attend college. The scores you earn on this CollegeBoard test can determine what schools you are eligible to attend, as well as have an impact on whether or not you are eligible for certain academic scholarship programs. Generally students take the test during your junior year in high school, but some students wait until their senior year. You'll need to submit your scores with your college application. Required test scores vary from college to college, but you can take the test more than once to get a higher score if that's what you need to get into a certain college. To register to sit for the exam, go to Official CollegeBoard website. Available testing dates are listed on the screen, along with details about how much time is left to sign up before registration closes. Click on "Register Now" for the date that you want to test, and follow the on-screen instructions to sign up. 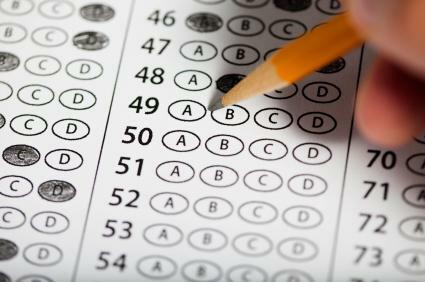 The test is given at schools that have received authorization to become SAT test centers, with options available in most communities. When you register, you will be directed to select the testing location most convenient to you. Visit the SAT Code Search page to find out what options are available to you. As of 2012, the cost to take the exam is $50. Students who cannot afford the exam can apply for a fee waiver. See SAT Fee Waivers to learn how to apply for a waiver. The SAT test is broken down into three, timed parts. The exam is three hours and twenty minutes long, and has a variety of questions. There are a total of 67 questions in the critical reading section. There are two types of questions in this section: questions on passages that you read, and sentence completion questions where you have to choose the best word given the context of the sentence. All questions in this section are multiple choice. The critical reading section is broken down into one 20-minute section and two 25-minute sections. There are a total of 54 questions, divided into two types. The first section requires you to solve a problem, and choose the best answer from a list of options. The second type of question requires you to solve the problem and "grid-in" your answers. You are allowed to use a calculator and scratch paper. This section is broken down into one 20-minute section and two 25-minute sections. There are three types of questions, comprising a total of 49 questions, in addition to one essay. The entire section lasts one hour. In this section you are required to improve sentences, identify sentence errors, and improve paragraphs. These sections are all multiple choice, asking you to give the best answer possible out of a list of choices. In the essay, spelling, minor grammar issues, and general neatness do not count against you. You only have 25 minutes to write the essay, so the graders do understand that this is a first draft. There are a number of options available to help you get prepared to take the exam. The CollegeBoard website is a good place to start the process of preparing to take the exam. There is an SAT Practice page where you can access free practice questions and a sample exam, as well as to view daily practice questions. You can also purchase more detailed study materials via the site. If you like the daily practice questions and you have an iPhone or iPad, visit iTunes to download the Official SAT Question of the Day app. Sylvan Learning - Offers in-person courses at Sylvan Learning Center throughout the U.S. There are a number of books designed to help students prepare for the SAT exam. Your guidance counselor may have a selection of exam prep books that students can use or borrow. The local library is also a good resource for finding this type of book. If you prefer, you can purchase books from your favorite local or online bookstore. The Official SAT Study Guide published by the CollegeBoard is the best book to start with, as it was created by the organization that developed the exam. Consider getting the book plus DVD version if you would like to enjoy the benefits of video-based instruction in addition to the printed guide. If you feel that you need practice beyond what is in this book, consider titles like Barron's SAT and Cracking the ACT. Be sure that any books that you select represent the most recent editions, as the exam changes from year to year. MajorTests.com has a selection of no-cost practice questions. Test Prep Review provides free practice tests. ProProfs.com offers two detailed practice tests at no charge. Making sure that you are properly prepared to take the SAT will help you cope with the stress of exam day. The day before the test, you'll probably want to take a break from studying to refresh your mind. Get plenty of sleep the night before; the test is long and potentially exhausting. Eat a healthy breakfast. Hunger does terrible things to test scores. Make sure you know where the testing site is, and allow plenty of time to get there. Testing starts promptly, and you won't be given extra time if you arrive late. Make sure you have a #2 pencil with you when you go in to take the test. No pens will be allowed. Bring a calculator in case you need to use it on the math sections. Take a deep breath, relax, and do your best. When you are registering for the SAT, you will see information about SAT Subject Tests in addition to the regular SAT exam. Some schools with competitive admission processes recommend that applicants complete subject matter exams before applying, and a few do require the exams. Even if you are not applying to a school that requires or recommends subject matter exams, if you are truly outstanding in a particular area, you may want to consider taking one (or more) of the tests as a way to help differentiate yourself from other candidates. See Why Take the Test on the SAT website to learn more. Your SAT test scores are one factor out of several that colleges look at when they're deciding whether or not to admit you. Some schools require this specific exam, while others will accept either the SAT or ACT. Check with the colleges you are interested in attending to find out if it is a requirement for you. As you approach your big date, remember that the SAT is one factor in the college admission process.